2018 release. Mack Wilberg is well known as one of the most revered vocal arrangers in the country. His work spans decades, and his tenure as the director of the Mormon Tabernacle Choir has produced countless recordings of incredible significance to the music community. This album celebrates Mack's arrangements with two brand-new original works ("The Prodigal" and "Cloud of Witnesses") as well as eight other magnificent arrangements. This music is vibrant, soul-stirring, and transcendent in the ways that are so unique to and characteristic of Mack's talent. 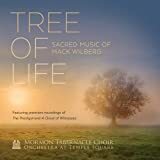 For any fan of Mack Wilberg or of beautiful choral music in general, this is a must-have album. Nearly 80 minutes in length, this collection is without precedent in Mack's career.